Another very simple effect I very seldom see discussed either by investment managers or anybody else is the effect of taxes. If you’re going to buy something which compounds for 30 years at 15% per annum and you pay one 35% tax at the very end, the way that works out is that after taxes, you keep 13.3% per annum. In contrast, if you bought the same investment, but had to pay taxes every year of 35% out of the 15% that you earned, then your return would be 15% minus 35% of 15% or only 9.75% per year compounded. So the difference there is over 3.5%. And what 3.5% does to the numbers over long holding periods like 30 years is truly eye-opening. If you sit back for long, long stretches in great companies, you can get a huge edge from nothing but the way that income taxes work. This isn’t exciting to talk about, but it is where the rubber really meets the road in terms of investment success. 3.55% per year outperformance after taxes is incredible, and you don’t have to pay a hedge fund “2 and 20” to get it. Alpha is interesting; taxes are AMAZING. 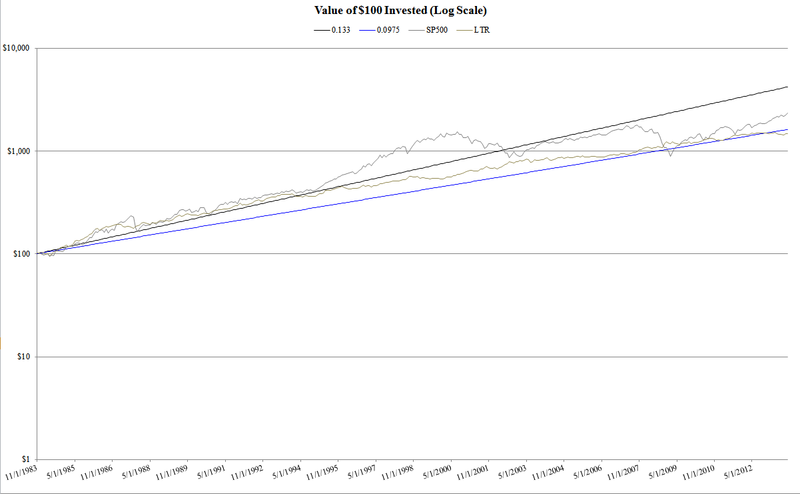 You end up with $4,235.43 for the 13.3% strategy and $1629.81 for the 9.75% strategy. This should be in neon lights. The tax-efficient strategy gives you a 4,235.43% return over 30 years, while the tax-inefficient strategy gives you a 1,629.81% return over 30 years. That’s up more than 42 times versus up more than 16 times. On a $10,000 initial investment, that’s a 30 year total of $423,543 versus $162,981. Stunning results. Alpha is investment-speak for risk-adjusted outperformance of a benchmark. It is the Holy Grail for which all investment managers aim. But the impact of taxes is more important and less talked about. Turn off the noise on CNBC and focus on maximizing your after-tax return. It may not make for exciting dinner-party conversation, but what matters is not what you earn, it’s what you keep. The thing about bubble tops is that usually at the time, the media and most of the public are caught up in the euphoria, and only a few voices in the wilderness talk of bubbles. I remember 1999-2000, and 2005-2006. Ordinary cocktail party chatter was about how everyone was getting rich, and most people couldn’t conceive of the bubbly asset going against them. The biggest fear was the fear of missing out. “You can’t lose owning your own home” was a commonplace meme I heard more than once from ordinary people before the housing bubble popped. Anyone who rented was considered an ignoramus. I don’t see a whole lot of bubbly price action today except in social media and cloud computing stocks, fine art, and high-end collectibles. Caution is warranted, but that is always part of my approach to investing. By most accounts the overall stock market is a bit overvalued at around 16 times trailing earnings, unless we are headed into a recession. Most of the increase in stock prices over the last year has been from P/E expansion instead of earnings growth, so further upside could be limited to the rate of earnings growth. Short term we are overbought and sentiment is pretty frothy. A 10% or so correction is overdue. In terms of stock market sentiment among the general public, I still see a lot of skepticism, under-investment, and fear of another crash. 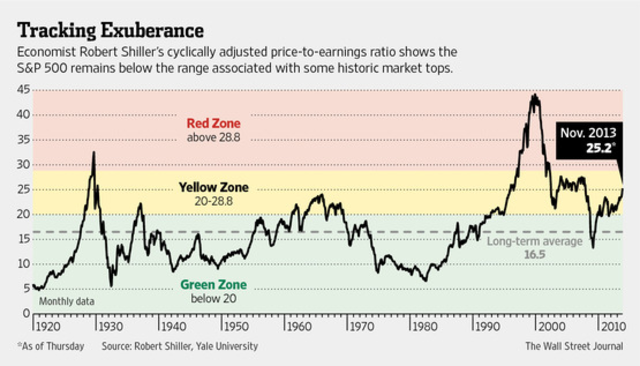 Even according to the Shiller cyclically-adjusted price-earnings ratio (CAPE), valuations don’t yet look bubbly. Above average yes; bubbly no. Some bulls will even argue that the CAPE is distorted by the Financial Crisis, as going forward it isn’t reasonable to expect a credit bubble burst and the resulting hit to earnings every 10 years. Does any of this mean we can’t have a bear market soon? Nope. The current bull market is about the median length at 4 years and 8 months old from the March 2009 panic low. By this yardstick, one could be just around the corner or 3 – 5 years out. The big question is will we go into a recession or not? Unless some combination of the Obamacare debacle, the Washington debt-default follies, and the Fed taper derail things, economic momentum seems to be slow but steady. Initial jobless claims are at post-crisis lows and this is with the sharp short-term negative impact from the sequester largely moving into the rearview mirror. Is it time to be wildly bullish? No. That was four years ago when everyone thought the world was coming to an end. Is a bear market on the way? Sure, sometime in the next few years. Is this a bubble top? Likely not. Some — like Ralph Acampora and Jeff Saut — see us in a long-term (secular) bull market. If so, a 20% – 30% pullback would be a good entry point. What will happen? Nobody knows. Investing isn’t about certainties, it is about subjective probabilities and calculated risk. Blood isn’t running in the streets, so I wouldn’t be putting a ton of new money to work now, but things can work higher from here. Keeping a close eye on your risk level is always a good idea. But without big policy screwups, 2014 could be a good year for the economy. We could also continue the slow grind higher in what Barry Ritholtz has called the most hated bull market of all time. Specialization is necessary to learn a field. But most innovation comes from the intersection of specialized knowledge with broader knowledge. Broad learning makes you more interesting and more creative. New ideas frequently come from the cross-fertilisation of two separate fields. Francis Crick, who intuited the structure of DNA, was originally a physicist; he claimed this background gave him the confidence to solve problems that biologists thought were insoluble. Richard Feynman came up with his Nobel Prize-winning ideas about quantum electrodynamics by reflecting on a peculiar hobby of his — spinning a plate on his finger (he also played the bongos and was an expert safe-cracker). Percy Spencer, a radar expert, noticed that the radiation produced by microwaves melted a chocolate bar in his pocket and developed microwave ovens. And Hiram Maxim, the inventor of the modern machine gun, was inspired by a self-cocking mousetrap he had made in his teens. Despite all this, there remains the melancholy joke about the scientist who outlines a whole new area of study only to dismiss it out of hand because it trespasses across too many field boundaries and would never get funding. Somehow, this is just as believable as any number of amazing breakthroughs inspired by the cross-fertilisation of disciplines. A third thing that is important is something Warren Buffett calls the circle of competence: Stay within what you know you can do and avoid things that you don’t know much about. I think when we see others succeed wildly with something, we are tempted to wade a bit beyond what we’re comfortable with. And that typically doesn’t work out very well. Buffett’s circle of competence comment is the source of the name of this blog. More important than a big circle of competence is staying within yours.